Silas Weir Mitchell, David Giuntoli. 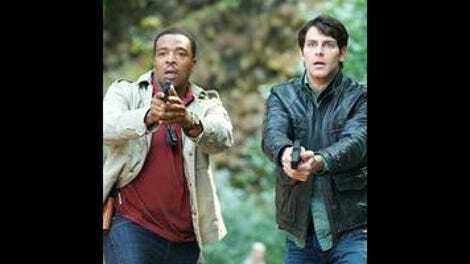 This season of Grimm began by uniting the rest of the team behind Nick Burkhardt in a way they’d never banded together before—with him kidnapped and under some kind of voodoo spell—and then returned a supercharged Nick as an inexplicably empowered leader. (Seriously, the show never bothered to explain anything related to what happened.) That unification grew stronger over the course of the season, with Renard leading Nick and Hank on the police side, while Nick oversaw and increasingly complementary team whenever he had to take matters into his own hands. This show still isn’t focused; it progresses haphazardly through clumsy development, forgets huge swaths of its own mythology for months at a time before allowing it to resurface without warning But this last batch of episodes, from about Adalind giving birth through last week, had a clear story to play out even when other individual cases dominated a single week. I laugh at the ridiculous things that happen out of Grimm because it has endeared itself to me with good-natured humor to deflate the pompous stoicism of the mythology. Well, two steps forward and one step back has become the narrative standard for Grimm. Sure, there’s a promising new character and overall progress with the entirely accidental and unearned discovery of a new key. But it comes at the cost of Nick’s Grimm powers, which kickstarts the third season with a quest to either go after born-again Hexenbiest Adalind—who has retreated to Europe where she still won’t find her child with the royals, continuing that plotline as well—or figuring out another way to reinstate his abilities (which may or may not be supercharged like they were after his Baron Samedi coma). All that, instead of, I don’t know, any other quest that would lead the team after more keys, or in direct conflict with the royals. It looks like Jacqueline Toboni will be sticking around for a bit longer, given that she’s now the only functional Grimm in Portland. 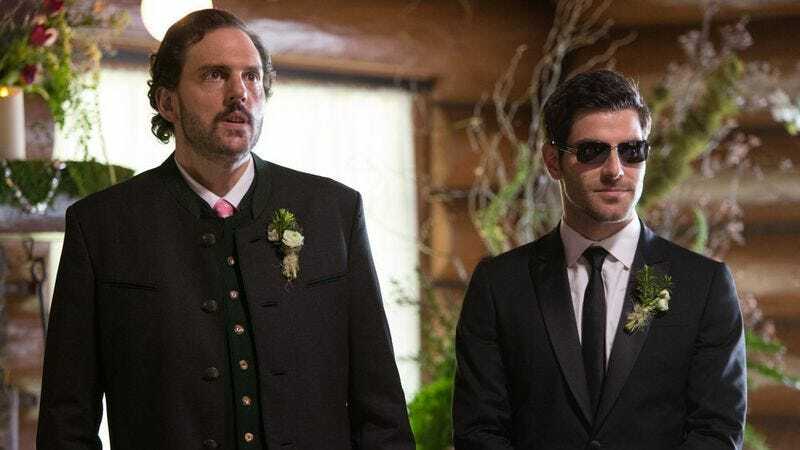 The Grimm tally has constantly changed over this final stretch, what with Kelly swinging in for an arc, Trubel’s emergence, and then last week’s brief appearance of another Grimm outside the Burkhardt family. And now she’s the lone Grimm standing, with a guest star dead after a prolonged illness and Nick suddenly without the powers that served as the impetus for the entire show. Grimm doesn’t even run on all cylinders with Nick at the height of his powers, still working out unknown areas of his character at the end of three seasons. Which makes the choice to take them away and examine who he is, how he goes about living out his ancestor’s mission, and how his team of friends and colleagues look at him all the more puzzling. As far as wedding episodes go, “Blond Ambition” is rather tepid. It has great comedic value, mostly thanks to Rosalee’s sister destroying her family’s traditional wedding dress and the ensuing scramble to obtain a replacement. (Monroe’s next-day statement to Rosalee’s sister that the couple actually hated the dress validated months of my roommates suffering my loud observations in support of that admission.) But all the sentiment expressed, from Monroe’s dad quickly coming around on the whole “no Wesen species intermarriage” bigotry to Rosalee’s vows invoking how the couple met after her brother was found murdered in the spice shop, went for the same togetherness note that most shows aim for when tackling wedding episodes. The main villainous thread through the episode is Adalind posing as the most obvious fake Juliette possible, which nobody notices in time, and using some sort of spell to take Nick’s Grimm powers away. The chaos she sets in motion is at times hilarious—as with that Juliette/Renard phone call where both parties come away angry and confused—and painfully tacky, like Adalind/Juliette seducing Nick. I was hoping that this bit of trickery would give Bitsie Tulloch a little more room to have fun as Claire Coffee, but it actually made her frustrated performance as Juliette better by comparison. Adalind doesn’t understand that her child will only be safe from the royals with someone as skilled at disappearing as Kelly Burkhardt. But because the Scoobies took the child, and kept the truth from Adalind, some karmic retribution had to come their way. So Adalind takes the resources in her mother’s storage unit and uses them to transform into Juliette, seduce Nick, and somehow (again inexplicably) take his powers in a reversal of what happened halfway through last season. In contrast to Monrosalee’s wedding, the unification of two incredibly well-matched characters who make each other better with every passing moment onscreen (despite the rote wedding scenes), Nick and Juliette have suffered disaster after disaster to keep them from being yet another married couple on the show. Juliette, under the influence of Adalind’s power, was drawn to Renard into some kind of self-destructive obsession, even erasing her memory. Now the hexenbiest has reduced Nick and Juliette’s relationship to tatters once again—and Nick even had the gall to offer weakly, “I was going to propose, but…” as they’re walking into the wedding. Honestly, I like them better when they’re struggling to connect, but only if Grimm barely devotes any time to their relationship. Once it shifts over into Nick winning Juliette back after some dumb mistake that everyone fell for, it’ll get boring fast. On one hand, Juliette has a point: life is extremely complicated with Nick because of all the Grimm and Wesen stuff. Nick says as much to Trubel when she asks whether he’d choose to be a Grimm. But at the rehearsal dinner toward the beginning of the episode, Juliette stands up to give a toast about how she and Hank are happy to be a welcome part of this new secret world they had no knowledge of before. It’s a pendulum, and when bad things like vengeful hexenbiests swing through, it’s going to make reconciliation tough. Trubel has the most harrowing arc of anyone in the episode. She’s trying to adjust to life around people she can trust, but increasingly views herself as a burden to Nick and Juliette and wants to strike out on her own. Nick wants her around, but Trubel’s right—there’s never going to be a point when she knows everything she needs to know, just like Nick won’t ever reach that point either. That’s where she’s at when Renard comes up to the door screaming that he needs to see Nick. He provides the helpful expository instructions that Nick has to drink something that was in Adalind’s cauldron—seriously that coupled with the pointy witch hat are the most stereotypical Halloween props this show has ever employed—before C. Thomas Howell shows up to shoot him on Nick’s porch. Once Trubel goes medieval on Dewey from Southland, she’s off to the races in order to save Nick and cause one hell of a commotion at the wedding. And it is a disaster, with everything going to hell once she walks in and sees Wesen everywhere, and in the ensuing scramble drops the bottle of all-important potion that only appeared onscreen for a minute. Nick manages to intervene, but his goofy-as-hell sunglasses/tux combination—seriously, there was no way that picture wouldn’t make the header on this review—turns out to be unnecessary, because his powers are already gone. Nobody really gets a complete final moment at the end of this finale, but the most emotionally resonant is Trubel’s distraught last line, so alone once again now that Nick can’t see any Wesen. That ability has defined him, and the show, for three years. Now he’ll either have to help guide Trubel as she takes over if Nick-sans-powers is an extended arc. Or this could all go away in the span of a two-part premiere just like the beginning of this season. In addition, there are plenty of other threads left for the show to pick up next season. Wu discovers the books from the Magic Airstream Trubel had been reading, which appear to confirm the Aswang he saw back in “Mommy Dearest” was real and not simply an isolated mental break. Renard is still in the back of an ambulance, and compared to what Trubel does to C. Thomas Howell’s Verrat FBI agent, there’s reason to invoke the same adage Bill Paxton espoused during the final moments of the S.H.I.E.L.D. finale. And Adalind continues to be an agent of chaos who doesn’t understand the full truth of what she’s done or who’s manipulating her. As a lead-in to a fourth season, “Blond Ambition” has the latter in spades, spinning out a bunch of different possibilities for where the show can go. And hey, it got through Monrosalee’s wedding ceremony before everything went to hell, so there’s nothing left hanging in that regard. But I’d be lying if I didn’t say that I’m bothered by the way Grimm consistently overcomplicates the amount of unfinished story by introducing more elements that it can conceivably resolve at a time. This finale is a perfect example of that, even while Silas Weir Mitchell makes me laugh and Toboni continues to make a case for inclusion as a series regular. Bud the Eisbiber returns! He has a great moment of comic relief as Nick and Juliette showed up to the wedding, but otherwise he’s been absent for basically the whole season. More Bud in season four! I guess it’s a good thing that Nick and Trubel moved the Magic Airstream, but didn’t it seem a bit out in the open in the middle of the woods? It’s secluded, but they really need a better spot for that thing, or to build something with better security so that things like the one guy on the force who went insane after seeing a terrifying Wesen finding the Grimm history books doesn’t happen. Having said that, more power to the police officer who notes offhand to Sgt. Wu that an inordinate amount of weird things happen at Nick Burkhardt’s house. The guy is not the laying-low kind of detective, except when it comes to Adalind in disguise. Hiyoooo! That’s all for Grimm this season. Next fall NBC pairs the show with newcomer Constantine, which looks more promising that Grimm’s pilot did three years ago, and at the very least looks somewhat better than the Keanu Reeves film version of the comics series. In any case, there will be at least one more year with these New Scoobies, and if the show can continue grasping onto the numbers it pulls in on Friday nights, it could be there even longer. Thanks for being here on an off-night throughout the season and commenting the next morning.